She already has a bouncy young son, haughty cat, a fringe with a mind of its own and lots of bills to pay, as she struggles to keep up with the yummy mummies of SE21. Join Beth in #1 of the London Murder Mystery series, as she discovers the nastiest secrets can lurk in the nicest places. Beth Haldane’s first day at her new job working as an assistant archivist at the prestigious Wyatts Private School hasn’t gotten off to the best start. After finding herself stuck in a room with no windows for three hours waiting for her boss, she decides to go and look for him. She eventually finds him but not quite how she was expecting. Dr. Alan Jenkins the senior archivist at the school is lay behind the bins, dead. It looks like he has been stabbed. With enquires into his death ongoing, it would seem that some people are quick to point the finger at the new girl. Well, she was the person who found him and statistics show that the finder is often the culprit! Using her journalistic skills she acquired from a previous job, she sets out to clear her name and discover who the real killer is. However, by doing so she has just put herself in danger too? 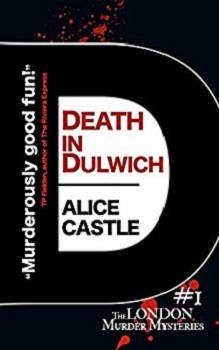 Death in Dulwich is a classic cosy murder mystery set in a middle class picturesque rural village in England – Think Murder She Wrote meets Midsummer Murders. The list of suspects is long. Everyone seems to have a reason to want Dr. Jenkins dead so Beth clearly has her hands full. The book is told mainly from Beth’s point of view as she tries to unmask the murderer whilst at the same time clear her name. She is a wonderful character, even if she does go on with herself a bit too much sometimes. I did wonder in real-life how far she would really get with her investigations until the police would come knocking and tell her to stay out of it, but I can understand her wanting to stand up for herself and not be blamed for something she didn’t do. If you like straightforward murder mysteries then this is the perfect series for you. I now can’t wait to get started on book two, ‘The Girl in the Gallery’. Death in Dulwich was published in September 2017 and has been a number one best-seller in the UK, US, Canada, France, Spain and Germany. A sequel, The Girl in the Gallery was published in December 2017 to critical acclaim. Calamity in Camberwell, the third book in the London Murder Mystery series, will be published this summer, with Homicide in Herne Hill due to follow in early 2019. Alice is currently working on the fifth London Murder Mystery adventure. Once again, it will feature Beth Haldane and DI Harry York. Alice is also a mummy blogger and book reviewer. Prize – Win signed copies of Death in Dulwich and The Girl in the Gallery (UK Only). *Terms and Conditions – UK entries welcome. Please enter using the Rafflecopter box below. The winner will be selected at random via Rafflecopter from all valid entries and will be notified by Twitter and/or email. If no response is received within 7 days then I reserve the right to select an alternative winner. Open to all entrants aged 18 or over. Any personal data given as part of the competition entry is used for this purpose only and will not be shared with third parties, with the exception of the winners’ information. This will passed to the giveaway organiser and used only for fulfilment of the prize, after which time I will delete the data. I am not responsible for dispatch or delivery of the prize. I loved your review! I shy away from murder mysteries but this one has a gorgeous cover! Thank you. I know the cover is quite simple, yet effective. Cozy mysteries are so fun. I haven’t read one in a long time though. I hadn’t read one in a while either. They make a great change from Thrillers. Mysteries are so fun! I’ll check it out. Great, I hope you enjoy it. Cozy mysteries are great reads on a rainy day. I will keep this one in mind, thank you for sharing! You’re welcome. Cosy Mysteries are lovely and warming. I’m not much into murder mystery but this one has piqued a small spark in me. Great, I hope you get to read it sometime. Sounds like a good mystery. Great review! Thank you. It is a good mystery book. This sounds like so much fun! I enjoy these type of books. It was a lot of fun to read. Great review 🙂 I am definitely starting to enjoy the murder mystery genre. Too bad the giveaway is only UK. Good luck to those who entered! Thank you. Murder Mystery is a genre growing on me too. Great review Stacey, I don’t read a lot of cozy mystery but I am really intrigued of this book it really looks and sounds absolutely amazingly great. Plus this is the first time I heard about this book, thank you so much for sharing your awesome post and for putting this book on my radar.